— Confirmation of 'Telcam's death from NYX. In 2558, the Office of Naval Intelligence carried out a top-secret assassination operation that eliminated the head commander of the Servants of Abiding Truth, Avu Med 'Telcam  The codename of the operation was redacted and only known to a select few. In the wake of the Human-Covenant War, the Office of Naval Intelligence sought to incite rebellion between various Sangheili factions on Sanghelios and began arming the Servants of the Abiding Truth. Aided by the ONI covert unit Kilo-Five, Avu Med 'Telcam secured arms and munitions on New Llanelli and used them in a bloody campaign against Arbiter Thel 'Vadam. However by 2558, Avu Med 'Telcam had outserved his usefulness to ONI's plans and was slated to be dispatched on New Llanelli. On January 21, 2558, 'Telcam was in a ruined city on New Llanelli with a group of his followers, when ONI's Section Three authorized his assassination at the hands of SPARTAN-G059. Arriving in the city after being deployed from the Winter-class prowler UNSC From the Ashes, SPARTAN-G059 eliminated 'Telcam's Kig-Yar scouts and Unggoy guards. Arriving at 'Telcam's location in a ruined tower, the Spartan-III burst into the room and engaged 'Telcam and his two Sangheili commanders. After a brief skirmish, the Spartan quickly killed the commanders and engaged 'Telcam himself. 'Telcam then immediately opened fired upon the Spartan with a Type-51 carbine. Avoiding the carbine fire, SPARTAN-G059 took cover and deployed a bubble shield over 'Telcam to block his rounds. Acting quick, the Spartan then slid inside the shield and managed to knock the carbine from his grip. In the process, however, 'Telcam seized the Spartan's neck and hurled her into a pillar. SPARTAN-G059 recovered and rushed 'Telcam, knocking his Type-1 energy sword from his hand just as the Sangheili activated the blade. 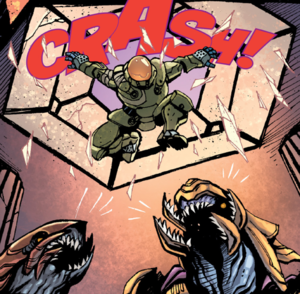 The Spartan maneuvered around 'Telcam using agility and armor thrusters, eventually knocking the Sangheili to the ground. As 'Telcam picked himself up, SPARTAN-G059 aimed her pistol directly at the Bishop's face. Before SPARTAN-G059 pulled the trigger to execute him, 'Telcam uttered a single final word: Wort. After her primary target was eliminated, SPARTAN-G059 was extracted from the planet by From the Ashes' onboard AI, Nyx. Although the death of Avu Med 'Telcam dealt a severe blow to the Abiding Truth's command structure, there remained the possibility that another member would assume the role as the monks' leader. The Spartan-III assassin did not claim the life of her secondary target, Avu Med 'Telcam's protege, Dural 'Mdama. 'Mdama, now known as the Pale Blade, had risen to become a leading member of the Abiding Truth and was fortunate not to be among those in the attack.